Only four days remain of the 40th Galway International Arts Festival, but the highlights for this closing lap include the world premiere of a major opera, the first in the event's history. 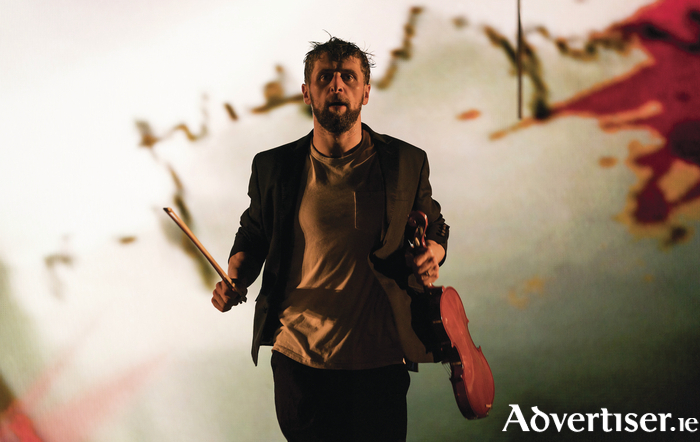 Recently awarded the prestigious Fedora award, The Second Violinist is a new opera by Donnacha Dennehy and Enda Walsh, and stars one of Ireland’s leading actors, Aaron Monaghan, in the title role. It will include a chorus of 16 and an orchestra of 14, together with principals, music staff, creative, production and technical staff. It runs at the Black Box Theatre until Sunday. There is no performance tomorrow. Other theatre highlights include Dublin By Lamplight, which has wowed audiences and critics alike (it runs until Sunday at the Town Hall Theatre ); the Abbey Theatre’s production of Two Pints by Roddy Doyle, which will be performed in pubs throughout the city; Cover My Tracks starring former Noah and the Whale frontman Charlie Fink (running until Sunday at An Taibhdhearc ); physical theatre show Driftwood, which has been enjoying standing ovations since its opening, runs until this Saturday in the Bailey Allen Hall, NUI Galway; as well as Crestfall, Bathroom, How to Catch a Star, Pumpgirl, and Yellow Moon. This Saturday will see a rehearsed reading of Patricia Burke Brogan’s award-winning play Eclipsed, featuring the original Punchbag cast from the 1992 production. It is on at 2.30pm and 6pm in the O’Donoghue Theatre, NUIG. The remaining music acts in the festival include Altan, James Lavelle, Saint Sister, Icleandic musician JFDR, Badly Drawn Boy, and Áine Cahill; and the sold-out concerts in the Festival Big Top with 2FM's Jenny Greene & the RTÉ Concert Orchestra (tomorrow ) and The Coronas (Saturday ). The visual art exhibitions continue until Sunday and admission to these shows is free. On the street keep an eye out for i-Puppets who will explore the city streets at 6pm on Friday and Saturday as well as visiting the Absolut Big Top for some pop-up performances at this weekend’s final Big Top gigs. The festival’s free Vinyl Hours programme at the Festival Club in the Rowing Club, Woodquay, will see various performers at the festival discuss their favourite albums, including Charlie Fink at 6pm this evening. The first week of the 2017 festival will be best remembered for Brian Wilson's wonderful concert at the Bog Top, the brilliant stage show Tristan & Yesult, and The People Build, a spectacular architectural event devised by French artist Olivier Grossetête. The latter took place last Saturday in Eyre Square, and saw more than 400 volunteers transform 1.6 tonnes of cardboard into a building. The design was inspired by the Aula Maxima in NUIG. On Sunday the public joined forces to take part in a celebratory demolition as the cardboard building came tumbling down. The event was sponsored by Walsh Waste, who recycled the cardboard after the event.